A MAN arrested under the VLAD laws for assisting a mate at the opening of a clothing shop will not seek bail before his March 24 court date because he fears his guilt has been pre-determined. Concreter Ben Wilson, 29, wants to spend as much of the mandatory six-month sentence as possible outside solitary confinement. He was arrested at Beenleigh on December 8 after he helped open the 12-Gauge Clothing outlet as a favour for a mate who was a member of the Rebels Motorcycle Club. It was 13 days later before he was afforded the right to a shower and a change of clothes. His girlfriend Ashley Metcalf of Mountain Creek said yesterday that despite Ben not being a member of the club, they had no confidence he would receive fair treatment under the new Vicious and Lawless Association Disestablishment laws of the Newman Government. Ms Metcalf said although it was five weeks until his court appearance and despite the success of four of the Yandina Five in obtaining bail, Ben would rather remain in the general prison population than run the chance of spending any longer than necessary in solitary confinement. If convicted of association he faces a mandatory six-month sentence less time already served. When the new laws forced the closure of the Rebels' Beenleigh clubhouse Mr Cook, who held the lease, decided to use the premises as an outlet for his clothing range. Ms Metcalf and Mr Wilson offered to help Mr Cook's wife prepare and open the store for business because the laws prevented Mr Cook doing so. She said the couple walked three uniformed police through the premises the day before it was due to open and had received no warning of any likely trouble. However by 9.30am between 20 and 30 police were onsite and when a television crew arrived Mr Wilson was arrested. Officeworks, sell cars and furniture, and break the lease on the couple's rental property, and return home to live with her parents. Her father Steve, a small businessman of Warana, said Ben's fears that his guilt had been predetermined were formed by the manner he was initially treated in Brisbane's Court 20 by Chief Magistrate Tim Carmody. He said it was apparent little attention appeared to have been paid to the circumstances that led to Ben's arrest. Mr Metcalf said the couple had simply been employed to set out t-shirts at the store and help run the opening day. 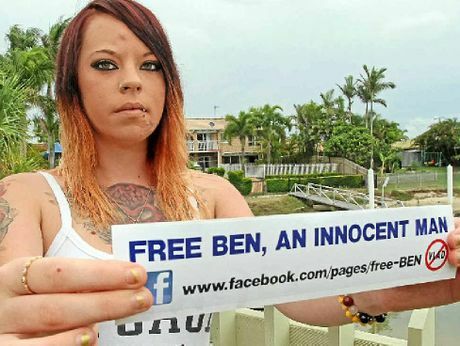 Ms Metcalf has launched a Free Ben webpage and produced flyers to be distributed at Sunday's Freedom Rally in Brisbane and ordered Free Ben stickers which are being sold for $5 each to help fund his court case.